First of all, what is a farrier? A farrier is a specialist in equine hoof care, including the trimming and balancing of a horse's hoof and the placing of shoes to the horse's foot. A farrier couples a subset of the blacksmith's skills (fabricating, adapting, and adjusting metal shoes) with a subset of veterinary medicine (knowledge of the anatomy and physiology of the lower limb) to address the care of the horse's feet. My farrier of more than 30 years has to retire because of major health issues. Not only is he our farrier, after all these years, he is also a really good friend. The trust and loyalty that we built, over these many years, is going to be next to impossible to replace. My husband and I realize this but had to find a competent farrier. We also realize that in fairness to the farrier we must not compare, but rather look for someone new and take him/her on their own merits. We have a new farrier, who we really like as do our horses. So how did we go about finding this individual remembering the old adage "No feet, no horse." A farrier must meet a number of important requirements like all professionals. Our requirements for a farrier are not just trimming the horse's feet. We want a farrier who must be able to do corrective shoeing and trimming to meet any pathologic problems that a horse may have or develop. It is also important that the farrier understand how a horse moves, his gaits, etc. We happen to have two Kentucky Mountain Horses and they are "gaited." Gaited horses move differently--from the shoulder rather than the knee. They tend to have more extension from back to front and also many have stifle problems. My husband and I do not like any weighted shoes, etc. In fact, our horses are barefoot and do just fine. Many farriers who say they specialize in gaited horses automatically leave the toes long and slap on four shoes around, caulked or weighted. I want a farrier who looks at the horse's conformation, the slope of the shoulders, the coupling, the legs and feet, etc. No two horses are alike. There is no one way to shoe every horse! I want a farrier who is not going to cause future problems or immediate lameness and one who can work to keep a horse pain free and sound, if possible. Education - Did you know that in the United States a farrier does not have to be certified? In fact, anyone can claim to be a farrier! That is quite amazing. The industry really should be regulated in some way. My farrier who had to retire could hand forge shoes, read x-rays and had a intricate knowledge of the anatomy and physiology of a horse. He was a corrective shoer. Many of the vets in the area worked hand and hand with him for years. Someone who has apprenticed with an experienced farrier, in my opinion, often is better than one who has just gone through a "basic training" school. Note: In the United States the primary and most recognized certification is the American Farriers Association's (AFA) certification: Certified Journeyman Farrier (CJF). The Worshipful Company of Farriers (WCF) of London, England, recently approved an examination center in Colorado. Experience - Formal education is always a plus, however, I feel that a farrier who has apprenticed under a well respected farrier and has been working a number of years brings hands on experience as well as tutelage to the job. One learns by doing. My new farrier, Aaron, learned under his father who is an excellent farrier in our area. Don worked with Aaron's horses when Aaron was a child. Aaron's father and mother are both well known and respected in the horse community in our area. It is important to me to have a farrier who is well respected for corrective shoeing and trimming by the vets and trainers. That's an indicator that he/she has an in depth understanding of a horse's conformation and the possible pathology that can befall a horse and knows how to work toward correction of the problem. A pulled tendon, sore back, arthritis, stifle problems, navicular, etc. can all be helped by a farrier who knows what he/she is doing! Below you will see a shattered hoof of one of my horses. I needed corrective shoeing until this problem grew out. I would not consider a farrier who is a "weekend warrior" or does shoeing as a second job. Also of importance, to me, is someone who keeps up with the studies, products, etc. in the farrier field. Visual from top of shattered hoof. You can see that the piece of keg shoe has already be affixed in this picture. However, I wanted you to be able to see the extent of the break before the filler was affixed. Handling the Horse - Horse shoeing can be a dangerous business. It is important to watch how the farrier approaches the horse, moves around the horse, talks to the horse, considers the horse's comfort (using fly spray in the heat of summer, for example), assesses the foot and conformation of the horse, asks you, the owner, if there are been any noticeable problems, etc. We all know that even the calmest horse can hurt you. I trust my farrier to do what he needs to do to ensure his safety. Usually a stern voice will take care of business. However, abusive behavior is not acceptable. Communication with you and the horse are important in a farrier. References - Ask your vet's office if they know the farrier you are considering or can suggest one. There are many community blogs and horse information sharing sites where you can inquire about farriers. Go to your local feed stores or tractor/farm stores to see if they have a message board or can recommend a farrier. Tack stores are also a good source of information. Talk to barn managers and trainers that you or your friends know. Most respected farriers will work with a vet if the horse has a physiological problem. Ask a potential farrier if they will provide you with references. Most will unless they do not need any more business. Check the internet to see if there are any complaints listed. Dependability - Unfortunately farriers are notorious for not showing up or being really late and not calling. I want a farrier who makes appointments, in advance, and shows up. Common courtesy speaks volumes about a person's character. Both Don Roof, our farrier of many years, and Aaron Hutchison, our new farrier, are considerate. If they have a problem, they call. If I have a problem--I call. Their time is their money as is mine. Both farriers accommodate changes in appointments--if need be. Spring and summer our horses are done about every 5 weeks--sometimes sooner in the growing season when the pasture is lush. Our last shoeing was a 3 weeks because the rain made the grass really happy and the horse's hooves really happy, too! The hoof growth usually slows down in the fall and winter. Our horses' patterns have tended to need trims about every 7-8 weeks. Finances - Keeping a horse or horses is expensive. Skimping on hoof care because of cost leads to worse problems down the road--disease, unsoundness, etc. I might point out that the cost does not decrease by the dozen! I will not overpay, however, a knowledgeable farrier sees my horses on a regular basis. Aaron Hutchison, like Don, is able to figure out what is going on and knows how to help with corrective trimming and shoeing. He has already done rocker toes and angle changes for stifle on my horse. He is in the process of working on a pesty toe crack that remains on a forelimb hoof. A Patchy shattered his hoof. The crack happened last year in the field. 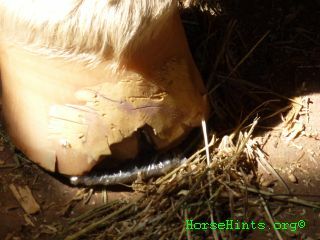 Don was my farrier then and did corrective work for the shattered hoof. Aaron has continued the hoof magic and we are almost there. When choosing a professional from any discipline many considerations go into that choice. I have listed 6 major considerations above, however, there are those intangibles that arenot listed. Follow your instincts. Simple visuals such as a farrier who rushes through his work, has temper tantrums, uses excessive discipline on your horse, is consistently late and not considerate of your time, etc.